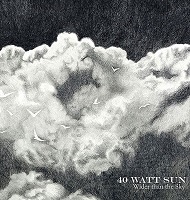 40 Watt Sun, I’ll be completely honest here, it took me another listen to appreciate this album. The feeling is minimalistic and clean. It’s mostly about the lyrics here and I am not a lyrics kinda guy. Plain and simple, I usually don’t listen for them as I am horrible at trying to piece them together. The track ”Stages” comes in clean on the guitar and it stays like that for the rest of the album. The vocals are mixed fairly raw with little work done. The bass is the star here in my mind as he seems to go off on random fills when he sees fit, I really enjoy that. The drums are extremely minimalistic, a reoccurring theme throughout the album. ”Beyond You” comes in with the same feeling as the last one, a very solemn feeling. This album sounds like pure loss, but, as I said before I am terrible interpreting lyrics so I may be wrong. It sounds like the soundtrack to a video game I’ve played. You play in a zombie apocalypse and it is a very dreary scene. I appreciate the sad feeling here. “Another Room” has a significantly slower tempo with very full sounding chords. The tone is still very somber. The vocals on this track take on a dark and almost hurt tone. The bass and drums stay together on this track, barely present until the end. “Pictures” has a resolving sound to it. The tone and tempo of this song is noticeably brighter. The vocals almost seem relieved, that is what this song sounds like…relief. Everything is getting better, I like this change of pace. There is even some lead guitar on this track, its very refreshing. “Craven Road” brings the tone back down to a solemn tone. The more I listen, the more I am learning to appreciate the minimalistic style here. There is very little in the way of production here, it all has a very organic feeling. There isn’t much left to say, this track is very similar to the other tracks. “Marazion” brings us to the close of this album. The pace is slow like the rest but this doesn’t feel sad, it sounds like the end. I actually really enjoy this track, the tone feels relaxing. Overall I may have misjudged the first time I listened. I wrote this off as monotonous and boring, but, after listening again I’ve discovered something. The minimalistic low tempo and lack of movement of this album makes for something unique. This is an album you can put o when you need to reflect and think. I am sure not everyone will get the point here and that’s ok… to those who just want some low maintenance music, this album is for you.